The 50 Year Reunion was held August 24 and 25, 2012, and was a great success! But even though the reunion is over, classmates continue to sign up and use this website. It's a great way to keep in touch with old friends. If you did or didn't attend the class reunions, you may view photos from the events. Click on the Reunion Photos tab on the left-hand menu. Access is limited to classmates only. Unlike most other sites, no information is ever shared or available to third parties. This site is maintained by your fellow classmates on a hosted website. If you have suggestions for the site, click on Contact Us at the top of this page. 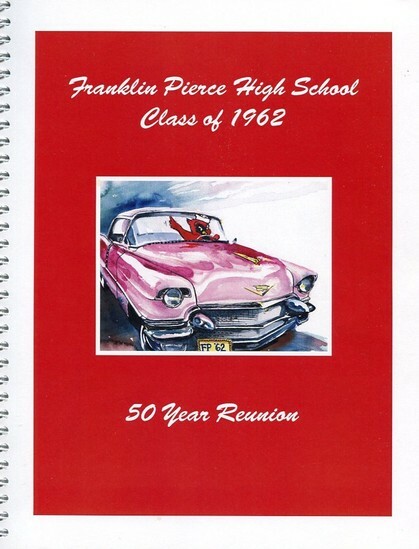 Welcome to the Franklin Pierce High School Class of 1962 website! This site has been created for the exclusive use and enjoyment of our class. 1. Click on the Join Here link below the login on the right, or click on Classmate Profiles above. 3. Click on your name, and follow the instructions to register. Only a few of the fields are required, so you don't have to fill in everything; you can fill in more later. But the more you put in, the better acquainted we will get. Or should I say reaquainted. So remember, a little bit of information goes a long way. And you can always come back and update your profile. When you have finished visiting the site, Log Out by clicking on the Log Out link on the left menu. SUBMITTED BY LAWRENCE CARSON: Remembering Old 50's & 60's Music ... Cars ...etc.